Happy Friday! May this song get stuck in your head like it is in mine. I love it! 1. The use of the word "baby" in almost every sentence out of Fred McMurray's mouth. 2. Great narrative: "Who knew that murder could smell like honeysuckle?" "She started crying like the rain on the window." 3. He falls in love with Barbara Stanwyck in literally 2 minutes. And goes from "Hiya baby" to "I love ya baby" in two days. 4. There are gunshots with no blood. It's not very often that we get the chance to see these great movies on the big screen and in the glory of a beautiful theater like the Bagdad. So thank you, McMenamins for showing us these gems. Now. On to Saturday. 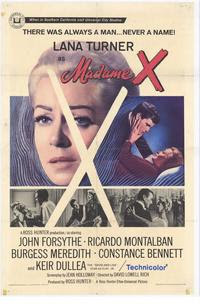 At 11pm on Saturday, the Bagdad, along with SuperTrash and Willamette Week, will be showing Madame X with Lana Turner from 1966. More film noir for $3. You can't beat that! Who wants to go? You can watch the trailer here. I love Southern food. I also love small plates. Put the two together and wowza - I am a goner. I took my restaurant group to the new restaurant Tapalaya over on NE 28th Ave and Burnside. Crispy catfish - crispy, light flavor and non-greasy. Portobello fries with homemade ketchup - crispy fried, just the right amount of mushroomy flavor. Black eyed pea salad - served on a great plate in a little metal bucket. It was a little difficult to maneuver my fork in the bucket, but a delight to look at. I had a bite of the mushroom bread pudding with gravy - delish and I wish I had ordered it so I could get the whole flavor. For dessert - a brownie with buttermilk ice cream - chocolate plus the tangy buttermilk is a great combination. I will say that in a fluke of flavor, the lemonade I had was truly, truly awful. It was pretty much just water and a bit of lemon juice without sweetener. Which would have been fine had I ordered water with lemon, but definitely not what I was expecting for lemonade. I'm not feeling very wordy tonight, so this is the end of my Tapalaya report. You should go check it out - and order lots of different things, so you get the whole tour. I am going to Texas. Yes. I am finally doing it. I am going to visit my faithful friend who has visited me more than 10 times in Oregon while I have been avoiding Texas for the past 15 years. 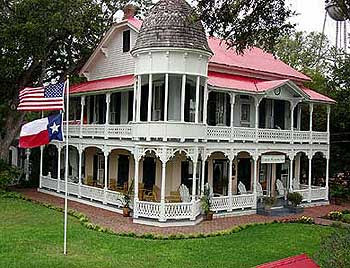 In two weeks, I will be spending the weekend here, in Greune, Texas and staying in a big fat mansion. We will be passing through Dallas, Austin and Fort Worth, I think, on a mini-road trip holiday. Have you been to Texas? What are your favorite places to eat there? I'd love to visit a hole in the wall awesome barbecue or TexMex place. Help me before I turn to Guy Fieri for help. There was this girl who didn't follow her dreams and you know what happened to her? She died! I saw a movie tonight that had a similar theme. I hesitate to say what it is, since I just spoiled the ending in my post title. But suffice it to say that she didn't follow her dream. And she died. Alone. It was a bummer. So everybody follow their dreams, k? Good. I'm either on the verge of success or total disaster. Last weekend to numb the uncertainty, my friends and I went to Ten-01 for happy hour and then to a shallow movie to numb the brain. I loved Ten-01's happy hour. I had the chorizo burger, with an an egg on top. It was small enough that the flavor perfectly sated any anxiety hunger I had. It was spicy and mellowed out by the yolk of the perfectly cooked egg on the perfectly baked bread. The andouille sausage and grilled bread were solemn companions, taking the job of flavor very seriously. Bites of the macaroni and cheese with short ribs and the truffled fries were delightful. Perfect comfort food in small enough doses that it doesn't break the bank and large enough that it fills your stomach to coma level, should you order more than one dish. Nice combo! Oh and I forgot. The bartender rocks. I asked for the bartender to surprise me with a great drink (non-alcoholic as that's how I roll) and he made me and a few of my friends the pinkest, frothiest, tastiest drinks with little flowers on top. Something with pomegranate and citrus and sparkle and something very delicious. So shout out to you, bartender man. We even had another patron stop by our table and ask what we were drinking because it looked so good. I waddled to the movie theater after that and sat through He's Just Not That Into You. While the drunk girls behind us made it slightly more entertaining, the movie echoed the sometimes uncomfortable, sometimes accurate reality that women are psycho and men are jackasses. Both of which I have personal experience with. I'm not going any further than that. Bon Iver. I love this song. I'm in a bit of a crunch right now and will be back to regular blogging after this week. I saw this trailer the other day and I can't wait for this movie to come out. I particularly like the use of the Decemberists' song in the trailer.